Twins! Peter Parker and Miles Morales are both Ultimate Spider-Man. Miles took up the mantle of Spider-Man after Peter Parker died. Miles went on after Ultimate Spider-Man to star in his own comic twice. This was a no brainer for Hasbro to create these two. They could do a repaint, add a few unmasked head sculpts, and they could sell two for the price of two. They really are the same figure twice. They both come with the very small body buck, with great articulation. They come with closed fists, open hands, and web shooting hands. In the packaging, Hasbro decided to ship them with opposite hands in web-shooting pose. That probably didn’t trick anyone. Even their BAF parts are both the opposite arms of Space Venom. They couldn’t even change that one around much. The best part, is that they came with unmasked heads. That really lends a lot to the figures, and makes them much more playable. They feel less like a direct copy. We get young Peter with his center-parted hair and a great smile. Miles looks amused, but slightly more serious. This is a great first duo for the Space Venom Wave. Hasbro has been using the multi-figure packaging for a while now, but this is the best use yet, and it follows well throughout this wave. More Spider-Fun to come. 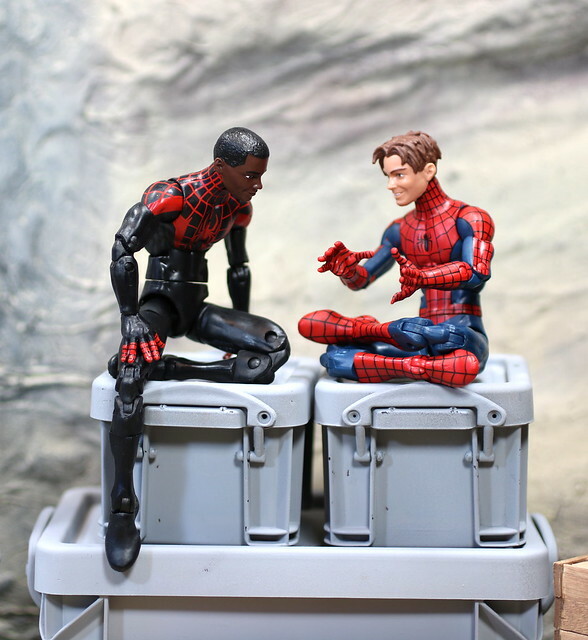 This entry was posted on Friday, February 10th, 2017 at 5:10 pm	and tagged with Hasbro, Legends, Marvel, Marvel Legends, Miles Morales, Peter Parker, Space Venom, Space Venom Wave, Toy photography, toy review, Ultimate Spider-Man and posted in Action Figures, Cartoon, Comic Books, Comics, Marvel, Toys. You can follow any responses to this entry through the RSS 2.0 feed.